It's been over a full week (by a few hours!) since Jacob left and we're hanging in there. The kids have been on Spring Break all week so we haven't gotten into a real routine yet but that's on the agenda for next week. We've been trying to keep busy with trips to the park with friends, running errands, and finding spots for all the random things Jacob left around the house. Staying busy seems to make the time go by a bit faster. Jacob's doing well. He's settled into life in Kuwait where they'll be for the next couple/few weeks. I can't imagine that living in a tent with 35 other people is fun, but he seems to be doing fine. He's able to call once a day or so although they've been busy with classes and acclimating to the weather/time change. I think the highlight of Kuwait has been the DFAC (dining facility) with the free Baskin Robbins and Krispy Kremes. Here are a couple of pictures of where he is right now. The tents that they're living in now. 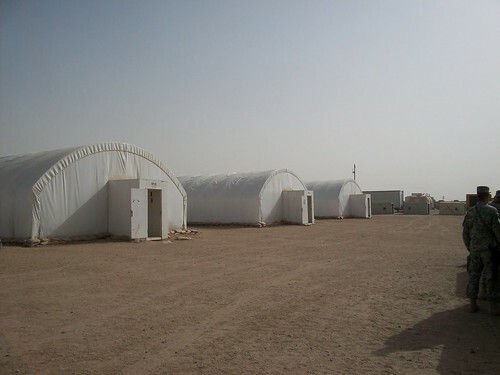 They're in the middle of the desert so all of the electricity comes from generators and the water has to be trucked in. 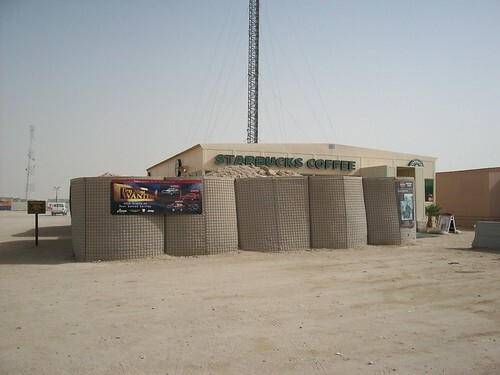 I think it is HYSTERICAL that they have a Starbucks in the middle of nowhere... must be true that the Army runs on coffee! !